March « 2011 « I'd rather be in France. Today was my first attempt at French cooking. A few observations immediately come to mind. First, is there any better smell than sauteing butter? Second, I need to learn how to read directions. Third, why are pearl onions so expensive? I paid $6 for a bag of about 15 of them, and the recipe calls for “18 to 24.” If I don’t find a cheaper source, I am going to have to change Ms. Child’s recipe to use a more readily available alternative. My dinner guest this evening suggested I try frozen. I’ll go that route first, and hopefully with enough butter frozen will taste just as good fresh. 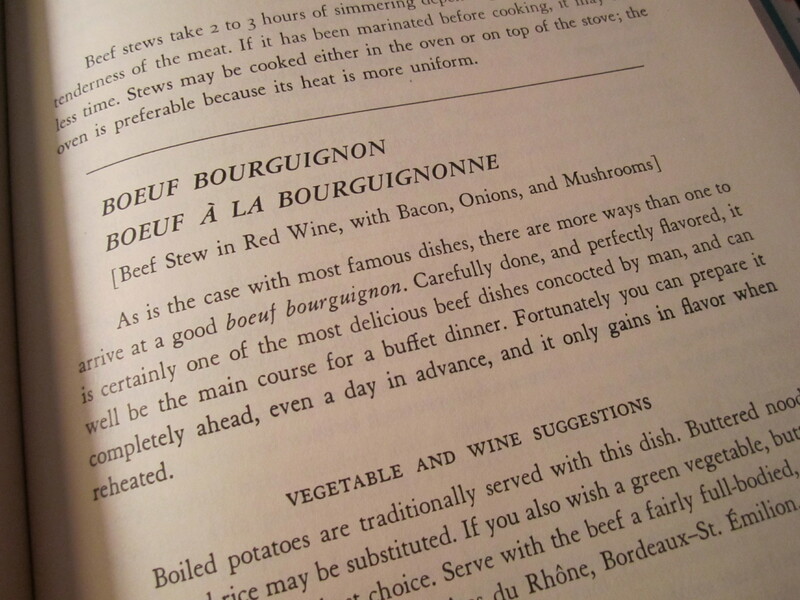 This afternoon I attempted to cook boeuf bourguignon from Julia Child’s Mastering the Art of French Cooking. 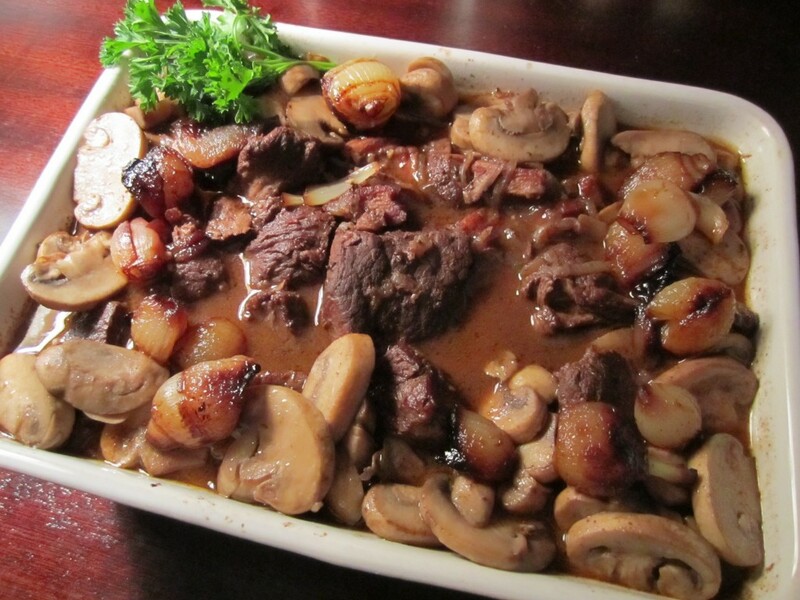 At first glance, this recipe looks pretty simple, but then you get to the part of the ingredient list that directs you to two other recipes for brown-braised onions and sauteed mushrooms. 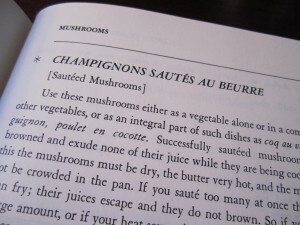 On top of that, you also have to cook some sort of starch to serve with your boeuf. I chose Julia’s buttered potatoes. In all, this dinner took around two and a half hours of prep time and three and a half hours of cooking. I started at 2pm and finally sat down to eat around 8:30pm. Now that I know what is going on, I think I can do the prep work in about an hour and then multi-task while the beef is cooking. Four hours for a gourmet meal wouldn’t be terrible. 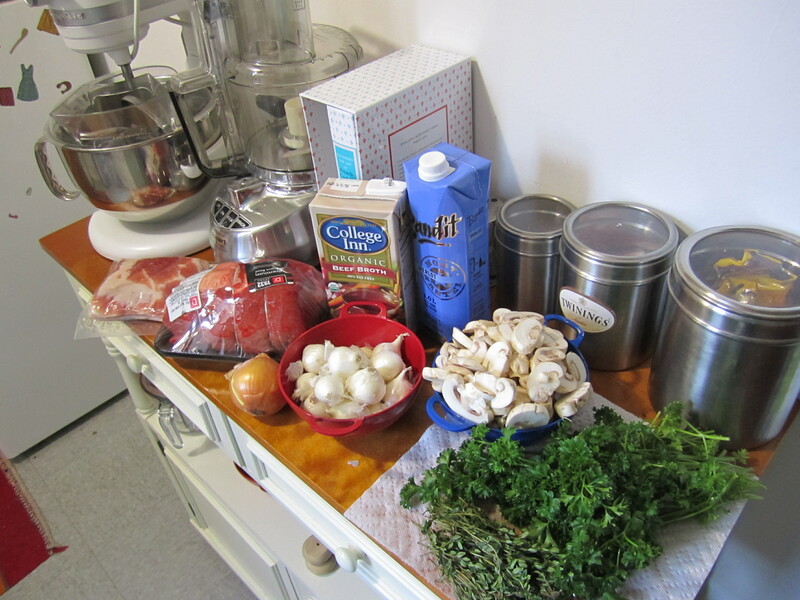 The makings of boeuf bourguignon. Almost forgot two vitally important ingredients. Within five minutes of cooking, I had tears streaming down my face. No, I didn’t burn the bacon or add too much thyme. It was those cursed pearl onions. Step one was to peel them. I didn’t know how to do this, so I did what I would do for a larger onion and cut both ends off. Then I attempted to cut through only the outer layer of skin so I could pull it off. That approach was almost a complete failure. 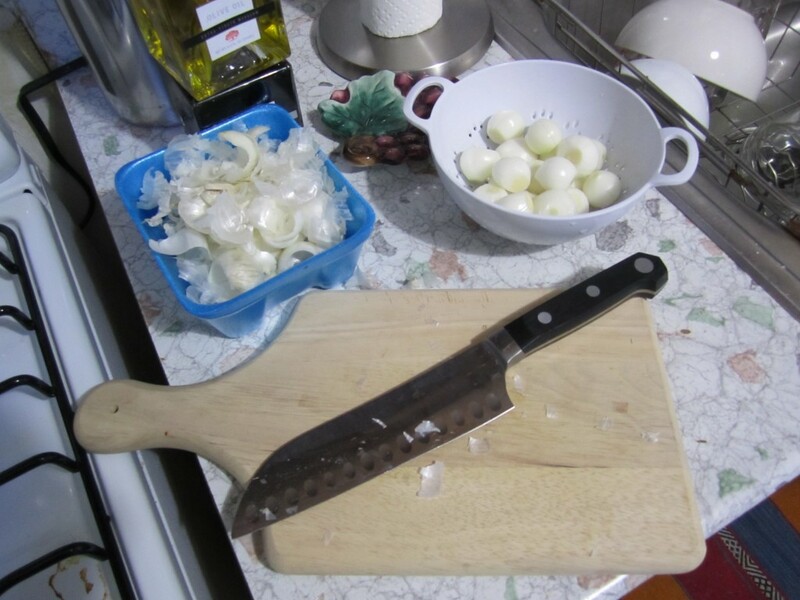 Not only did it fill my kitchen with toxic onion fumes that made me cry, it also made my onions fall apart after I cooked them for the requisite 50 minutes. Only afterward did I notice that Julia gives some advice on peeling pearl onions (she blanches them) and also very helpfully suggests you prepare them while the beef is simmering in the oven for three hours. I ended up watching three episodes of My So-Called Life on Netflix because I did everything out of order. 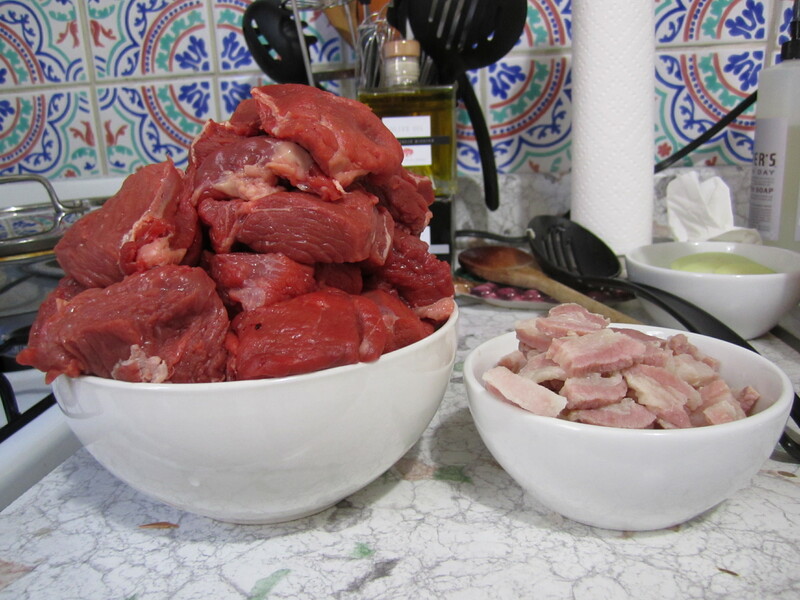 Another challenge was hacking my 3+ pounds of beef roast into two-inch cubes. I believe this is something you can ask your butcher to do for you, but the D’Agostino near me doesn’t appear to have any butchers, just teenagers that talk on the phone while they move stuff around in the meat fridges. 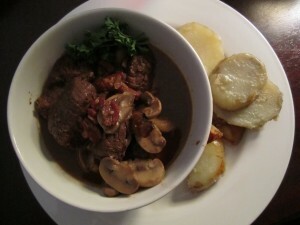 Eventually, the beef, bacon, beef stock, red wine, tomato paste, garlic and thyme were safely in the oven, the onions and mushrooms sauteed, and I put out a last minute invite on Facebook to see if anyone wanted to help me eat the 4-6 servings of fragrant deliciousness that was wafting from the kitchen. 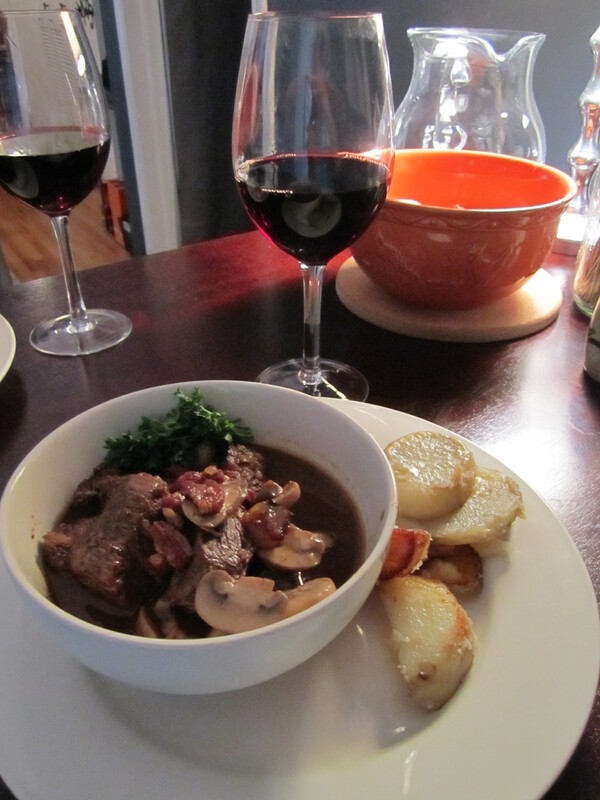 My friend and co-worker Sunday accepted the invite, and we were soon stuffing ourselves with some pretty damn good boeuf bourguignon. 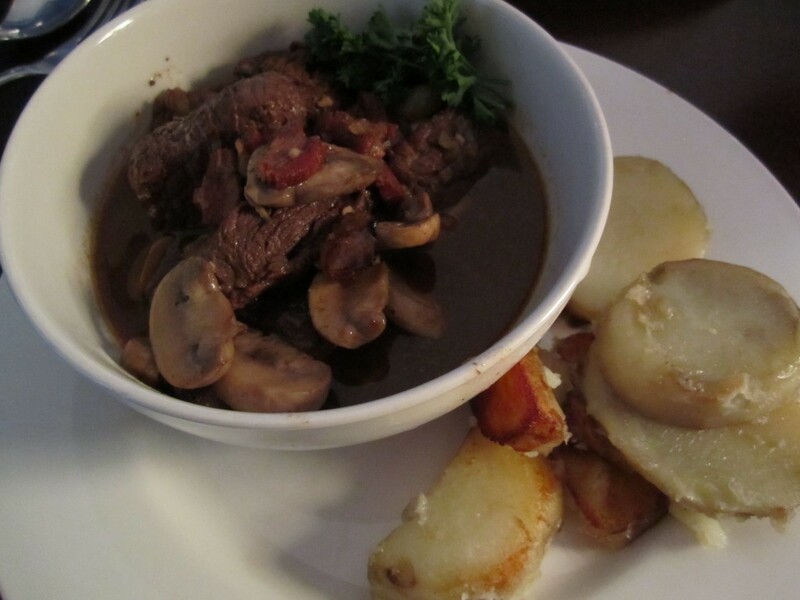 Even though I messed up the onions, and even though I wrongfully assumed I already had carrots when I was at the store and ended up making the recipe without them, I declare Operation Boeuf Bourguignon a success. 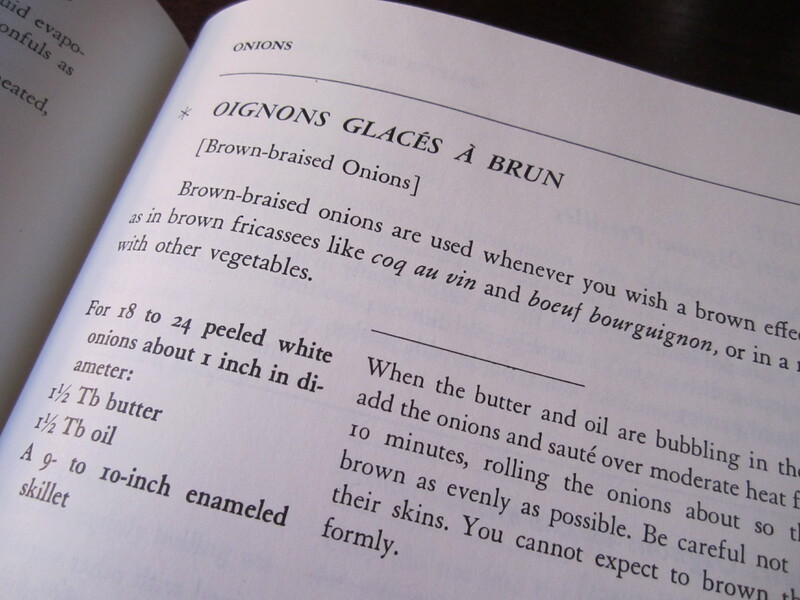 I knew going into the project that Julia Child was famous for her precise instructions, but several times I stumbled upon a relevant instruction only after I had amateurishly attempted to do it my own way. Next time I am going to read the recipes and chapter notes carefully before I even order the groceries. Can’t wait to eat whatever I end up making next. Exciting day! 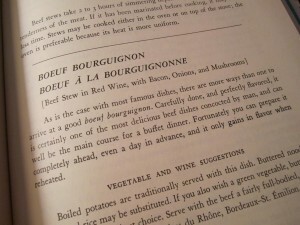 As mentioned in my previous post, I recently cashed in on a promised gift of a cookbook and today received my copy of Julia Child’s Mastering the Art of French Cooking! I was a little put off from getting these books after the whole Julie and Julia craze (although admittedly I love the Julia Child storyline of that movie, which was pulled straight from her memoir). A few months later I was reading Martha Stewart’s The Martha Rules where Martha describes the kinds of jobs she had before authoring a book on entertaining and becoming the Empress of Domestic Arts. She was a model, a stock broker, and a real estate agent, and then one day she decided to start her own catering business. As she got into the catering biz, she taught herself how to cook by cooking all of the recipes in Mastering the Art of French Cooking. Just like that. 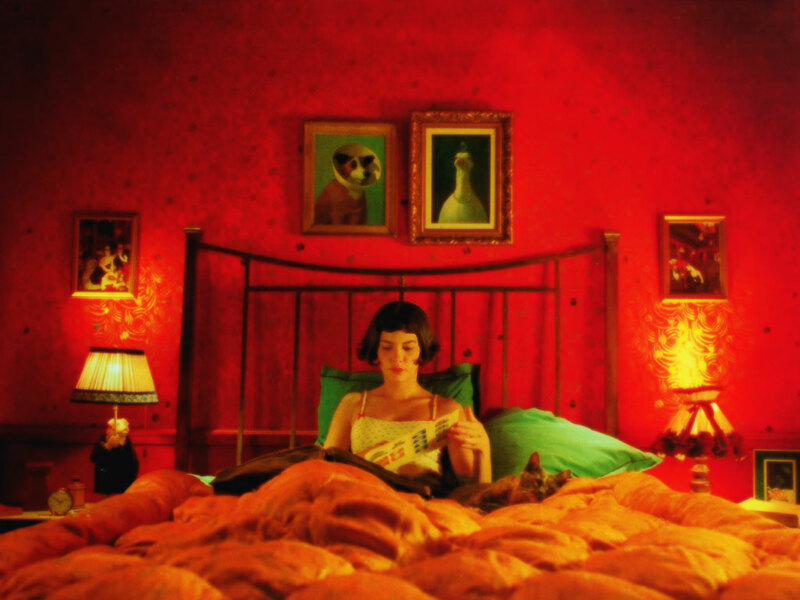 No year-long fanfare or movie deal as a result. Martha Stewart wanted to improve her cooking, so she cooked Julia Child’s recipes. And so, because I love French food, I am going to follow the careful instruction of Julia Child and teach myself how to cook. 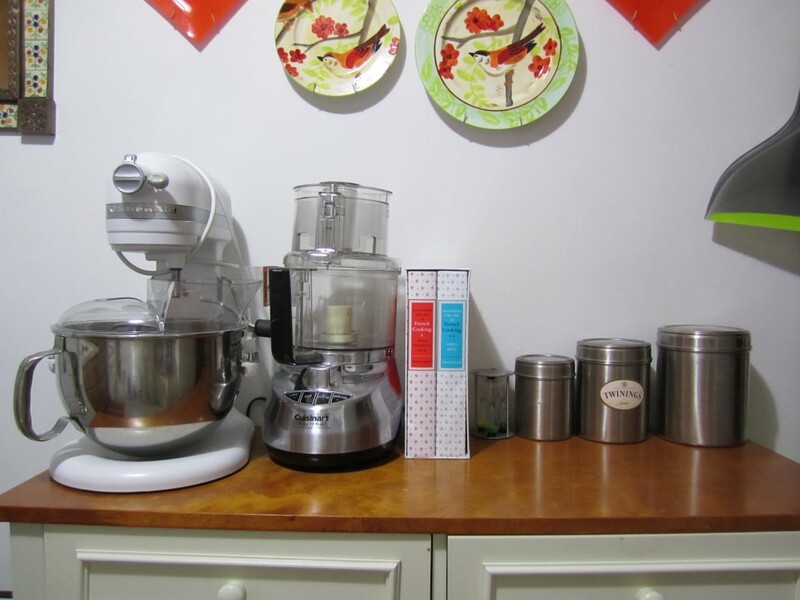 Until I come up with something better, I have put my new cookbooks in a place of honor next to my prized KitchenAid Pro 600 and food processor. I really need to figure out how insert letters with accents. The only way I know how to do it is to copy and paste from random words on the interweb that happen to have the accent I want. Anyone out there familiar with WordPress and know how to insert letters with accents? I picked some pretty typical French dishes, and I am wondering if they are so popular simply for lack of further investigation or because they are that good. I suspect the latter. I’m a little intimidated by the thought of cooking roasted chicken because it is my favorite thing to order from French restaurants and because 99.9% of chicken attempts in the universe end up dry or flavorless or both. 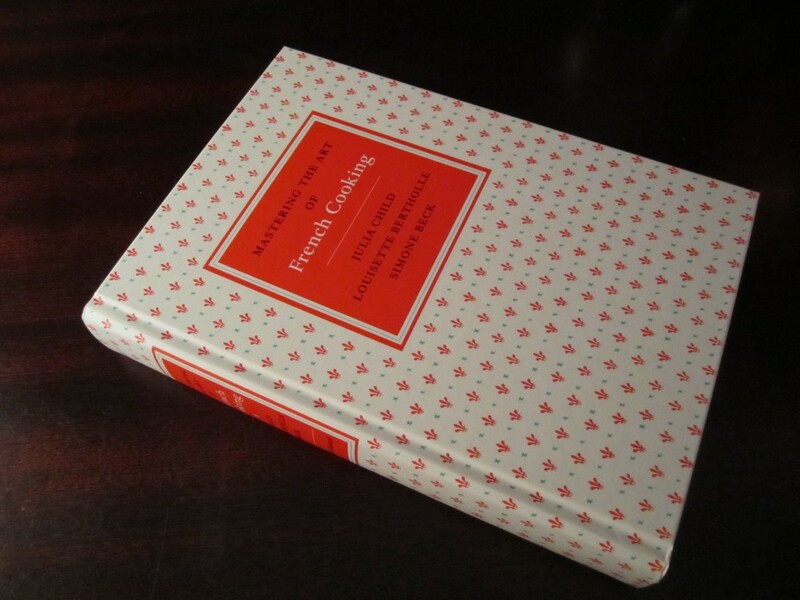 I’m afraid of insulting the entire genre of French cuisine by cooking dry chicken. And so, roasted chicken will wait. The mostly likely choice is French onion soup, but it’ll be a game time decision, and by game time, I mean before the 6pm deadline tomorrow for ordering my groceries from Fresh Direct so they will be delivered Saturday morning. I have two little touches of France in my kitchen so far: a grater shaped like the Eiffel Tower and a calendar of France photos my brother gave me for Christmas (above). This month is the amazing Mont St. Michel, which I visited back in 2003. 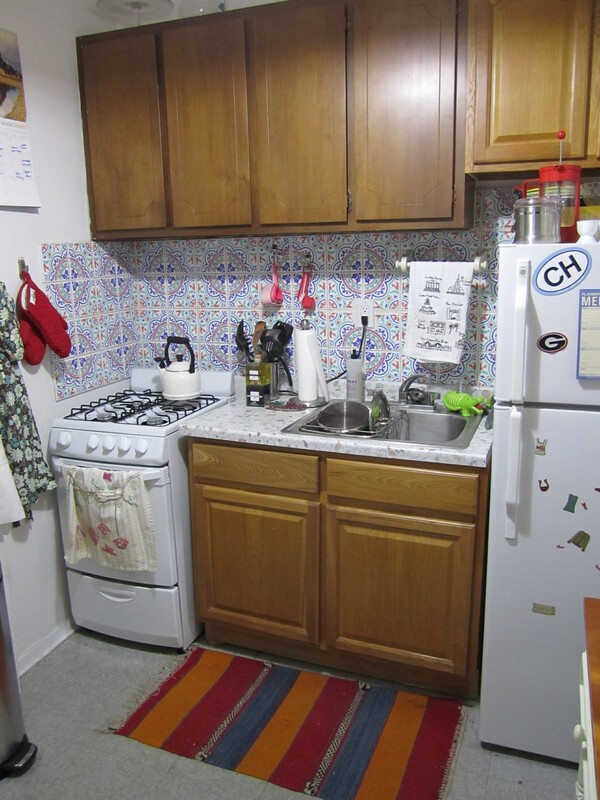 Its hard to tell the exact scale of my kitchen appliances (left), but both the stove and the refrigerator are miniature. The foot and a half of counter space you see in the picture is all the kitchen came with. Having been raised in the land of open kitchens (a/k/a The South), it’s been quite an adjustment. 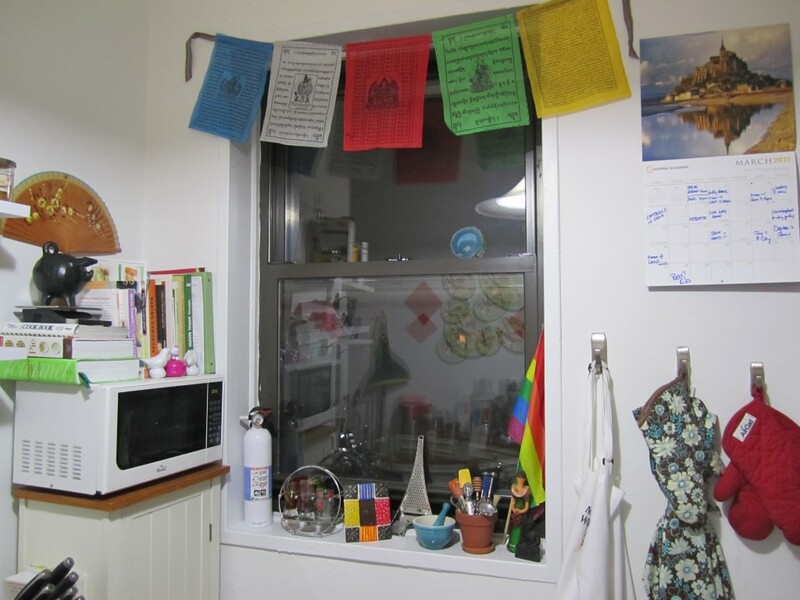 Since I am doing a little show and tell of my kitchen, I’d also like to point out the hand woven rug (left) that I picked up in Marrakesh, the string of prayer flags (above) that I recently got in Tibet, and the fan on the wall (above) that I purchased in Rome when it was approximately 1000 degrees outside. 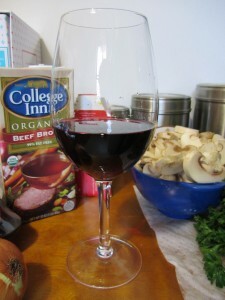 Check back in after the weekend to see what I have attempted to cook. 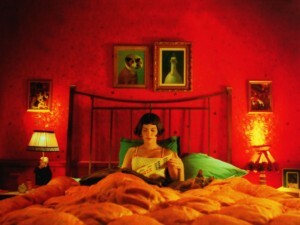 Also check back in the next couple of weeks because I am starting to get some exciting guest writers lined up!